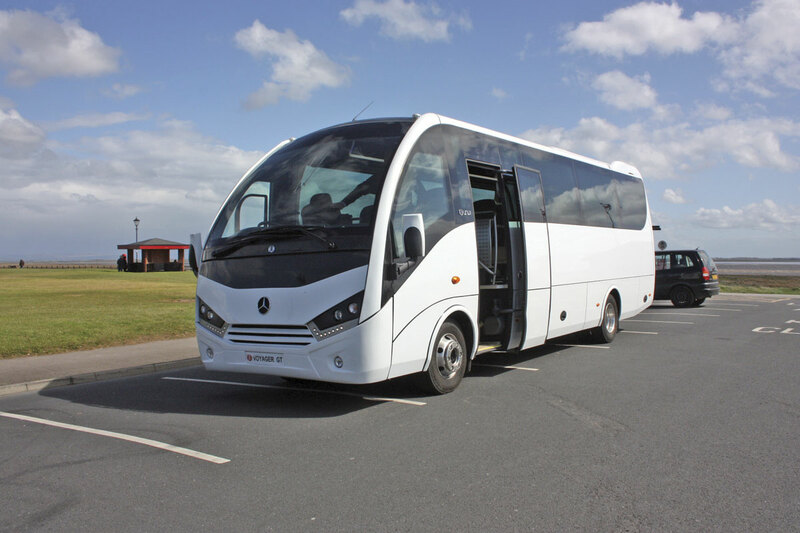 Although it had been rumoured for some years, the announcement by Mercedes-Benz that it would definitely cease production of the Vario in 2014, still came as a shock to the bus and coach industry. There were still some that thought Mercedes-Benz was crying wolf and would backtrack the decision at the twelfth hour. It didn’t, the final Vario chassis left the production line in 2014. 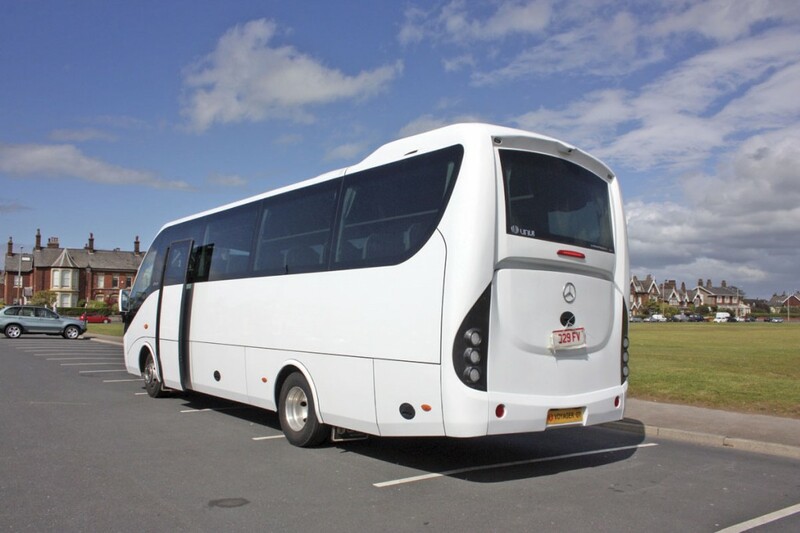 Many questioned why Mercedes-Benz was throwing away a market sector, the eight tonnes minibus/coach that it had practically to itself. Those able to appreciate the wider picture knew why the writing had been on the wall for some time. The Vario had increasingly become an ageing anachronism in the Mercedes-Benz chassis range, as the bulk of the componentry had been superseded in more recently introduced vehicles. To have updated the Vario would have cost a lot of money and the potential market for the vehicle was, in Mercedes-Benz terms, miniscule so it was never going to be viable. As far as they were concerned they were already producing an alternative modern chassis that covered the weight sector, the Atego range. From a bus perspective this is not quite true because the philosophy behind the Vario and the Atego is very different. Vario was essentially a large van whereas the Atego is definitely a small truck and there is a considerable price difference between the two. 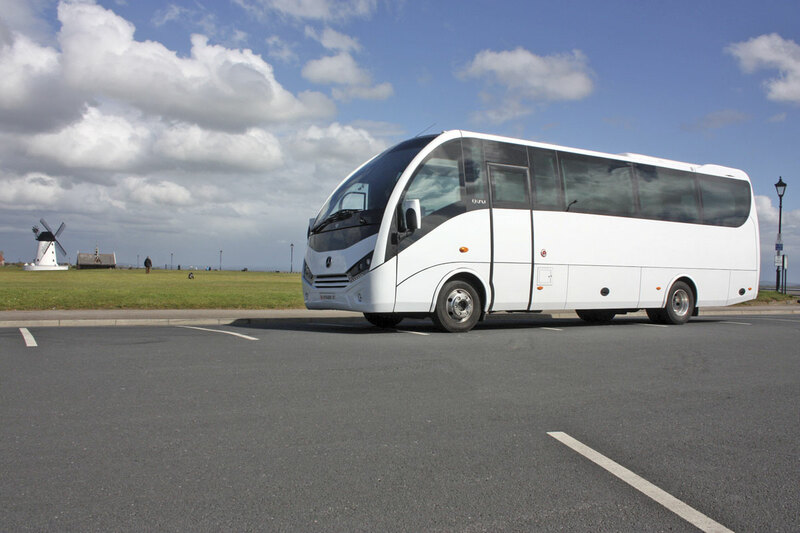 The loss of the Vario had a dramatic effect on many minibus and coach builders not only here in the UK and Ireland but also across the wider Europe. For some of them Vario had represented 50% of business so the search was on to find an alternative and quickly. At the various European Shows last autumn, most notably Euro Bus Expo in Birmingham, a number of potential solutions were revealed. Although Vario didn’t represent anything like 50% of the production of Spanish mini/midi coachbuilder Unvi, because of its very wide and diverse product range, it was nevertheless a significant model, particularly to its important UK and Irish markets. Unvi had taken the warning of the Vario demise seriously and though it managed to secure a sizeable chunk of the final chassis production run, the race was on to bring its replacement to the market. Early in its planning Unvi decided that its future in the 27-34 seat minicoach market lay in developing its new contender using the Mercedes-Benz Atego, two axle, forward engined chassis range. The decision to go that route was a fairly easy one for Unvi because it already had experience, going back over a number of years, of building successful products on the Atego chassis range, notably its Cimo and Touring models. They are typified today by the popular Touring GT, introduced a couple of years ago, which uses the 15 tonnes Atego as its base. But which of the wide Atego range of chassis should it use? The Vario had been struggling for some time over the question of gross weight, particularly on the back axle. Increasing demands from customers for better specifications like double glazing and air conditioning plus rising passenger weights meant that it was increasingly a struggle to keep the vehicle legal, especially on the rear axle where the additional problem of luggage exacerbated the problem. When the DfT was trialling in-road axle weighing equipment on the M4 in an attempt to catch overloaded foreign trucks; it was amazed to find that one of the most frequent transgressors was Vario minicoaches. Unvi looked first at using the nine tonne Atego chassis and actually built a couple of prototypes of its new model using this chassis but ultimately decided that the ten tonne version was a better option, giving much greater flexibility. The result of all that deliberation is the new Unvi Voyager GT, now starting to arrive in the UK in quantity. Unvi had presented prototypes of the design at the last Euro Bus Expo but its radical styling didn’t receive universal acclaim and it was obvious from the interiors, particularly the cab area, that these vehicles were very much prototypes and work in progress. I’m glad to say that the production versions have addressed these issues. The styling has been revised and is much less radical while the interior cab area is vastly improved and now meets the standards we’ve come to expect from Unvi. The result is a very stylish mid-range vehicle which is already beginning to attract customers both new and old. The other day I visited Unvi UK’s premises in Warton near Preston to inspect two of the new Voyager GTs. One was a 29 seater with manual transmission and the other a 33 seater with automated transmission. 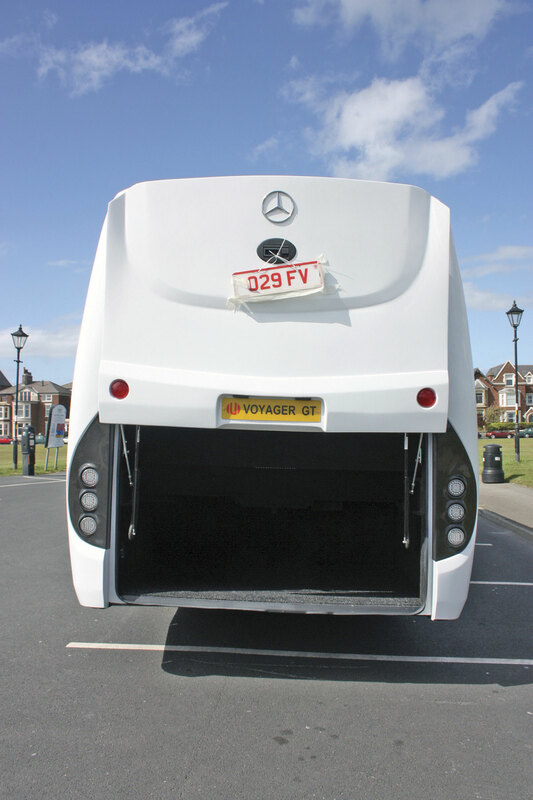 The Unvi Voyager GT uses the 10.5 tonne GVW 4.820m wheelbase Mercedes-Benz Atego 1023L chassis powered by the 5.1-litre Mercedes-Benz OM934, four-cylinder engine. This is turbocharged and intercooled and meets Euro6 emission standards using AdBlue. The standard engine rating is 231bhp and the maximum torque is 900Nm across a very wide speed range. It is also available on the similarly sized and rated Atego 1021L chassis on which the engine is rated at 211bhp with a maximum torque figure of 850Nm. Two types of transmission are available; the Mercedes-Benz G 90-6 six-speed manual transmission or the six-speed automated PowerShift 3 transmission. The front axle is a beam unit with a design rating of four tonnes. 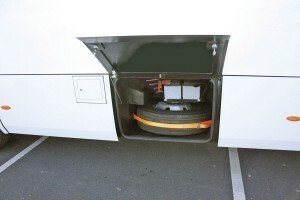 The air suspended and stabiliser equipped rear axle is a an eight tonne hypoid bevel unit while the front axle is mounted on parabolic leaf springs. Wheels are 6.75 x 17.5 units fitted with 235/75R 17.5 tyres. Steering is the ZF 8095 powered system with fully adjustable steering column and steering wheel. Braking employs a dual circuit hydraulic system with disc brakes all round. The system incorporates ABS and there is an exhaust brake. Electrics are 24 volt with a 28V/100Amp alternator. The vehicle is fitted with a 180-litre lockable fuel tank and a separate 35-litre AdBlue tank. Key dimensions for the Voyager GT are 8.955m long, 2.425m wide and 3.12m high. Framed in extensively corrosion protected square section steel tubing, the body structure meets all European Safety Standards including R66 rollover. The body front sides, rear and roof are clad in GRP. The entrance is behind the front axle and is fitted with an electrically operated, outward opening plug door. There is a good sized luggage locker on the nearside and smaller driver’s lockers on the offside, one containing the spare wheel. 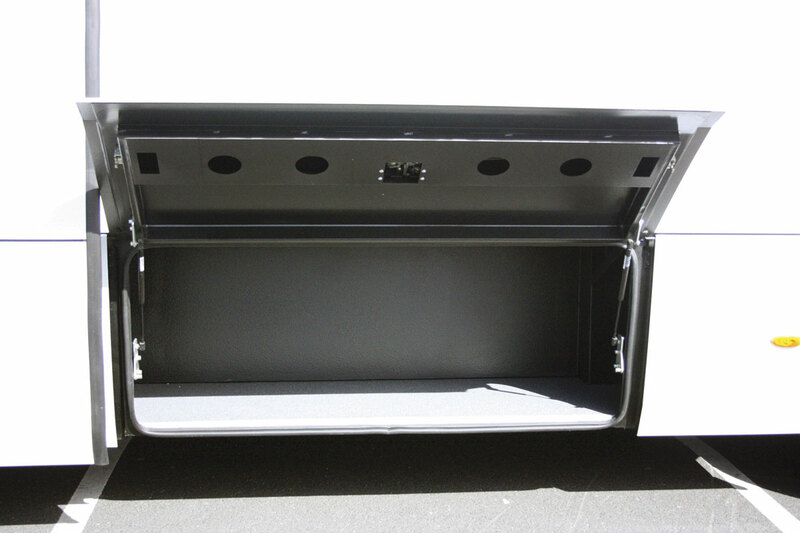 A good sized, carpeted and internally illuminated 4.0cu.m boot, with lift up door is provided at the rear. Glazing uses large panoramic, bonded, double glazed units with extra dark tinting. The screen is laminated security glass with a green tint and a deeper tinted sun band at the top. The rear window is single glazed. An emergency exit is located at the rear on the offside and incorporates fold out steps. The vehicle also has a driver’s door. Both the driver and courier side windows are heated. Three steps lead from the entrance to a central sunken gangway that is flat throughout the saloon with the seats mounted on podiums. The entrance area and gangway are carpeted in heavy duty carpet. The ceiling and sides are trimmed in GRP mouldings which have a soft touch, suede effect surface. Wood effect non-slip vinyl covers the floor. 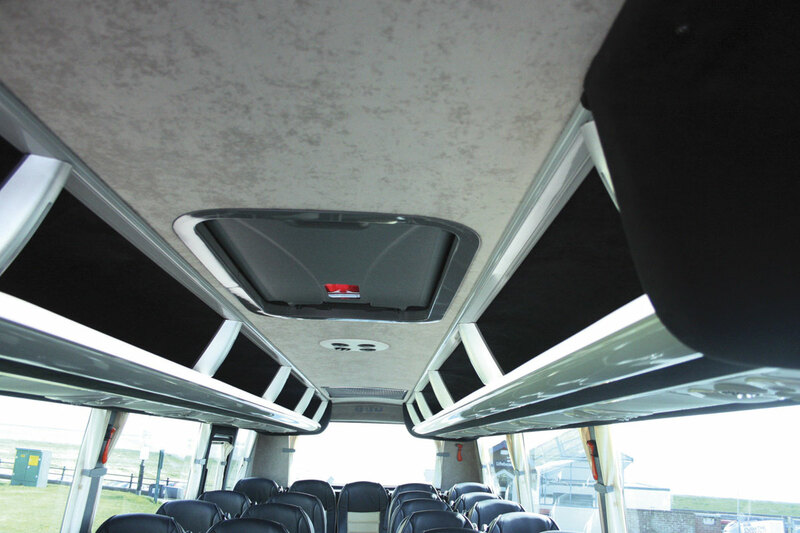 Full length racks extend each side of the saloon and have slim pillars for easy access. 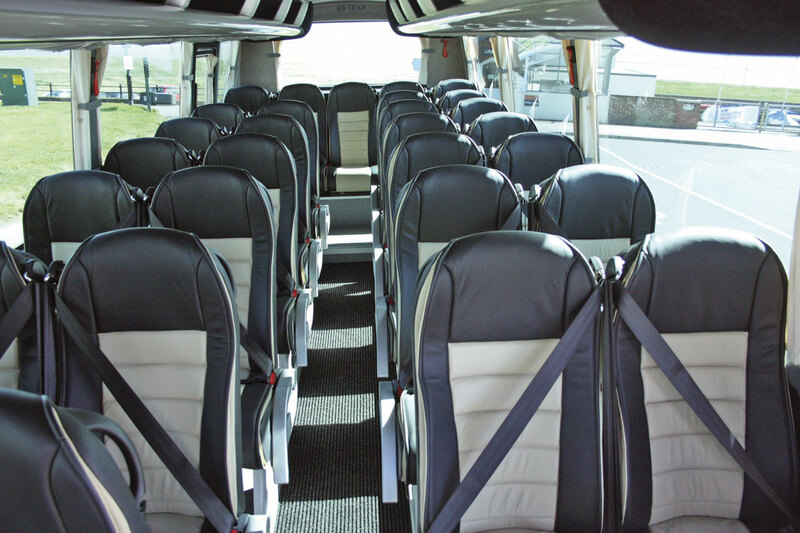 The racks incorporate individual passenger units with reading light, courier call and fresh air vent. The saloon is lit by full length diffused strip lighting which also has a lowered light level for night time operation. The entrance area is lit by halogen down lighters when the door is opened and the step edges and gangway edges are lit with LED lighting. Additionally, LED lighting along the edges of the racks adds to the general ambience. Windows are fitted with full draw curtains with tie backs on the pillars. Within the saloon there is provision for seating 33 passengers using 33C 120 Top Flair recliners normally trimmed in leather with a central fabric panel. 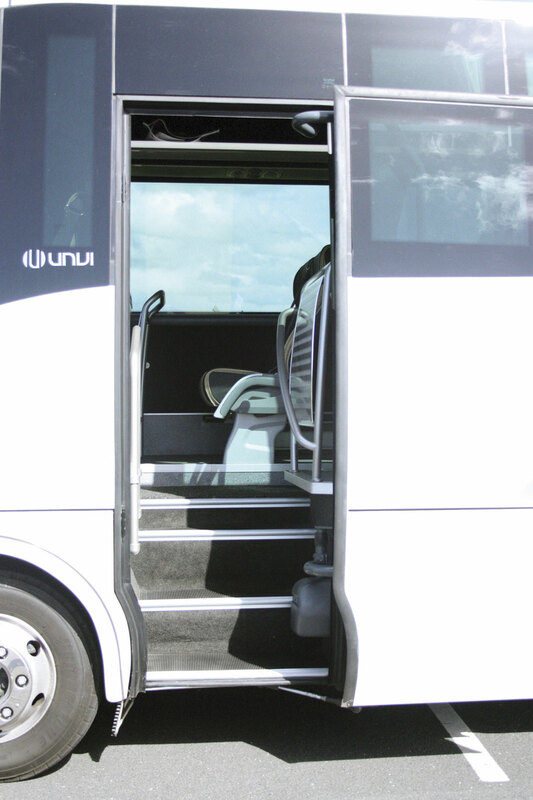 These have armrests on the side nearest the gangway and are fitted with three point safety belts. The courier seat reclines and has arms on both sides. 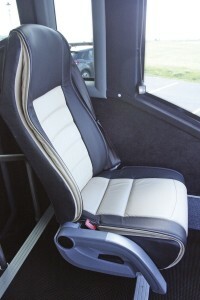 It is mounted alongside the driver and is a full size unit similarly clad to the saloon seating. The Voyager GT is fitted with convection heaters down both sides of the saloon. Air conditioning is standard using a high capacity Hispacold 7L roof mounted unit with air distributed through the racks and down the windows. There is also an adjustable glazed roof hatch which doubles as an emergency exit and a conventional offside emergency door on the offside, ahead of the rear row of seats. The cab is ergonomically designed and it is fitted with its own Mercedes-Benz heating and ventilation system. There is a driver’s door with electrically operated heated window. The window beside the courier is also heated. The driver’s seat is air suspended and trimmed to match the saloon seats. It has fold down arm rests and a three point seat belt. A personal locker beneath the instrument panel incorporates 12v charging points and there is another larger locker beneath the dash on the nearside of the cab. A Bosch professional line system incorporating AM/FM radio and CD player with amplifier is fitted. 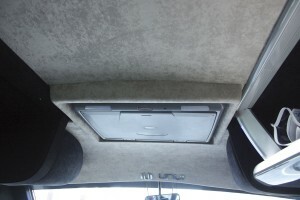 Sound is fed to individual speakers mounted in the saloon racks and also to speakers in the cab. 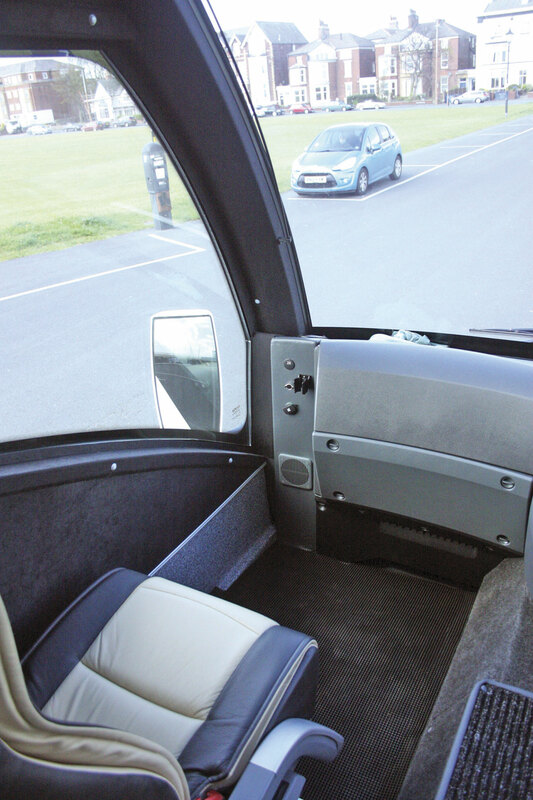 There is a PA system with a microphone adjacent to the driver’s seat and an additional microphone is provided for the courier which uses a special socket adjacent to the courier seat. 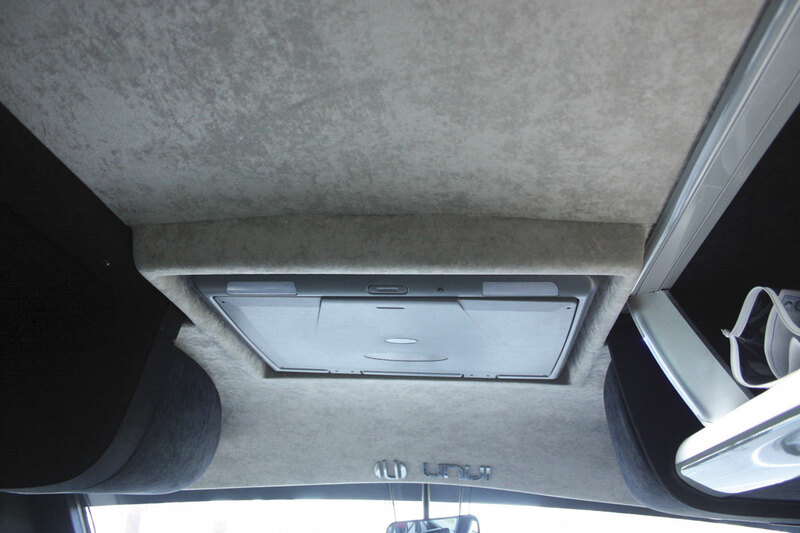 Standard equipment is a dash mounted DVD player feeding to a 19in TUV 154 fold-down monitor mounted in the headlining at the front of the vehicle. 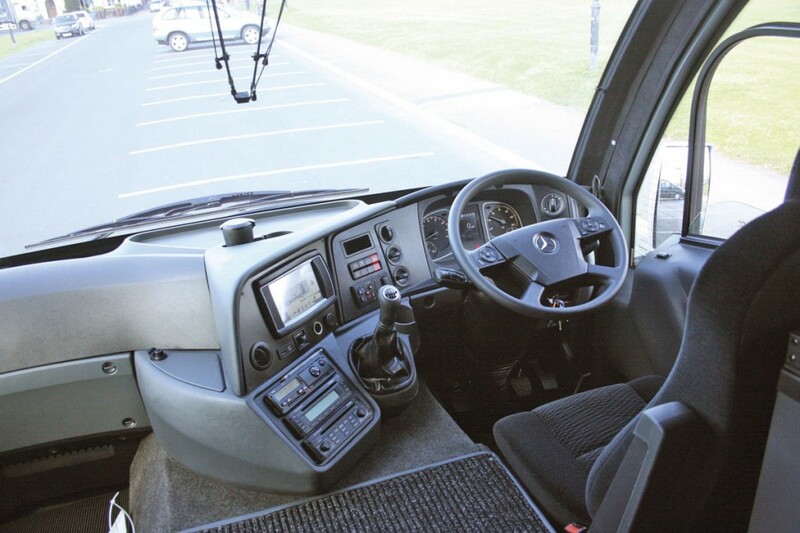 Driver equipment includes individual sun blinds for both sides of the screen, cruise control and a reversing camera with the image shown on a large touch screen that is also used to activate many of the vehicle’s systems. Unvi have always had a reputation for style and the Voyager GT certainly has that. The revised front end styling is a vast improvement and now gives the vehicle the classy look more in keeping with what customers have come to expect of Unvi. As ever, the quality of the external (and internal) GRP is of the very highest level. I particularly like the styling of the rear end – another Unvi trade mark. The quality of the exterior is maintained within the coach. The saloon is beautifully detailed and the fit and finish is to a very high standard. The cab area is hugely improved over that fitted to the prototypes shown at Birmingham last year. 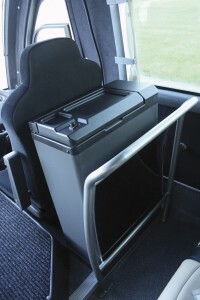 The large housing covering the engine is unavoidable but Unvi have transformed this into a neat unit which allows easy access to the courier seat. 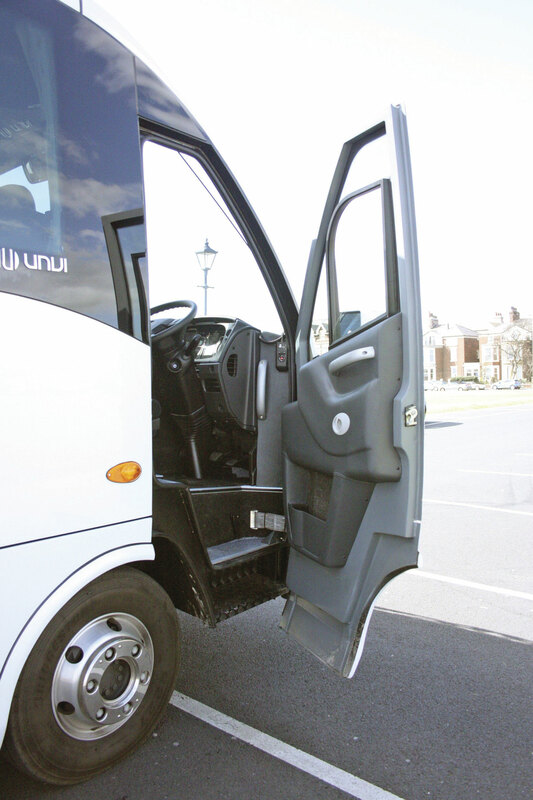 Energetic drivers can access their seat from within the vehicle, although most operators would frown on this practice and prefer their drivers, from a health and safety point of view, to use the door specially provided for them – but then we all know what coach drivers are like! It is inevitable that one will compare the vehicle with a Vario which is not really fair because these are very different animals. The base chassis is much heavier and the engine is a much larger unit than that fitted to the Vario. Inevitably the packaging required some creative thinking. Any ideas that it is a Vario are immediately dispelled when you occupy the driver’s seat. This is a very modern vehicle with all the standard features you would expect; among them an adjustable steering column and seat, a well laid out dash with clear instrumentation and all controls placed in ergonomically determined positions. The massive screen gives excellent vision and although the A pillars are quite large, as dictated by the strictures of compliance with R66, they do not really cause blind spots. The dual lens exterior mirrors, which are heated and electrically adjustable, have the turn indicators integrated into them, giving excellent all round vision. Comparison with Vario also disappears once you power up the Mercedes-Benz diesel. Gone is the sound of an ageing tractor replaced by the hum of a modern direct injected, turbocharged diesel. When you begin to drive, the difference is obvious, there is bags of power delivered quietly and smoothly. The evidence of that power and the enormous torque reserve is immediately apparent as you accelerate the vehicle up through the gears. Six-speed gearboxes haven’t always been the smoothest things to use, especially when making down changes, but the Mercedes-Benz GL90-6 is a very nice box and with the light, power assisted clutch it is easy to make nice smooth changes whether going up or down the box. Ride at the front end and road holding are of the highest order. The vehicle just sits on the road and goes exactly where you want it to. With discs all round, the braking is top quality and you can achieve nice smooth braking but if you need it this vehicle can be stopped very quickly – just hope the passengers are well strapped in! Additionally, you have the exhaust brake which allows you to brake even more smoothly. Although not a great lover of exhaust brakes I have to admit that the one on the Atego is very effective. The Vario was never the most scintillating of hill climbers, but the Atego most certainly is. I drove both the lower powered 211bhp version and the more powerful 231bhp version and they were equally impressive, largely due to that wide torque band. I was fortunate in being able to drive both a straight manual and the version with the automated six-speed transmission called the Powershift 3, which is undoubtedly a massive improvement over the previous versions. This one changes much quicker, especially from speed one to speed two and it makes the changes smoothly and without any fuss. The transmission has two settings ECO and Power. I selected ECO for driving around town and found it to be perfectly adequate, short shifting to keep the speed balanced, but without using high revs and thus wasting fuel. Out on the open road the value of the Power setting came into its own, allowing you to quickly take the vehicle up to cruising speed without any effort. The kick-down is instant and very useful at times, especially on the motorway for getting past trucks. Although an automated transmission you do still have the option of driving it manually, although without a clutch, and this can be useful if you particularly want to hold a gear such as on a long climb or when manoeuvring at low speed. Thankfully, the transmission does not have the annoying habit that some automated transmissions have of shuffling back and forth between gears when it can’t make its mind up which one it should be in. Reluctantly I left the driver’s seat in the hands of Unvi’s UK Manager, David McKinless, and tried a stint as a passenger. I found the ride very comfortable, thanks no doubt to the use of air suspension at the back. There was a taughtness about the whole body structure and as a result no shuddering or shimmying of the body. It was also very quiet making conversation at normal voice level easy. The Flair Comfort seats are very comfortable giving a nice level of softness but at the same time giving good support to the back and thighs. Vision out of the massive panoramic windows is just excellent. Ambience in the saloon from the combination of the convection heating and the air conditioning means that a perfect ambience where the feet are warm enough and yet the upper body is also comfortably cool can be maintained. Unvi’s Vario based Riadas, which in many ways have been pace setters in the up to 34-seat category, were hugely popular vehicles. The new Voyager GT is a very worthy successor, taking the genre to a whole new level. I have no doubt that it will be a worthy replacement and judging by Unvi UK’s order book, that is already starting to happen.